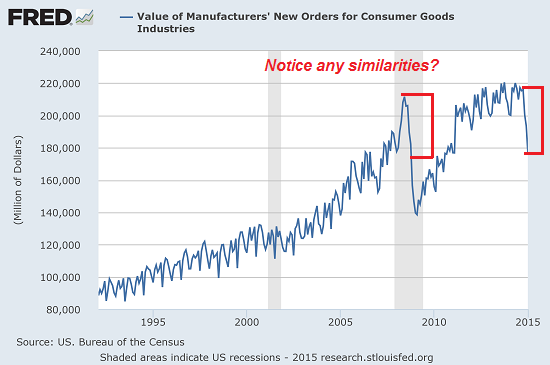 Is Our Economy's Cinderella Carriage About to Turn Into a Pumpkin? The past six years of expansion have been as illusory as Cinderella's magic carriage. In a recent conversation with Chris Martenson of Peak Prosperity, I suggested that the Fed's policies were akin to monoculture agriculture.At first, slamming fields with nitrogen and phosphate fertilizers and herbicides and pesticides yields bumper crops. In an analogous fashion, the Fed's zero-interest rate policy and massive goosing of credit appeared to work wonders on the U.S. economy: growth exceeded 2% and inflating bubbles in bonds, stocks and real estate have fueled a speculative frenzy, all based on a simplistic faith in the Fed's power to keep assets rising forever. But the magic of flooding the fields with credit/fertilizer doesn't last forever. The soil is stripped of value and yields plummet; at some point, the returns on flooding the economy with credit diminish: only marginal borrowers and the riskiest speculations are left to exploit. Just as insects quickly develop resistance to pesticides, the economy develops resistance to cheap credit. Since interest rates cannot fall much below zero, there are no more gains to be had from lowering rates. Since qualified borrowers have already bought a new vehicle or home, the only borrowers that are left are the ones that will default at the first layoff, medical emergency, etc. Just as flooding a field with fertilizers and pesticides does not restore the soil, flooding the financial system with liquidity and cheap credit does not restore health to a stripmined, financialized economy. Just as monoculture erodes the soil, financialization hollows out the economy and strips away the values that underpin sustainable, healthy expansion. What the Fed has fueled is the predation and pillage of the real economy by Wall Street and financiers. The Fed insists that Cinderella's carriage is forever golden, ignoring the increasingly obvious reality that the carriage is turning back into a pumpkin before our eyes. The Fed's magic was always a short-term fix, akin to over-fertilizing and over-poisoning our economy to create the illusion of massive growth in profits and stock, bond and home valuations. The past six years of expansion have been as illusory as Cinderella's magic carriage. Now that the magic is wearing off, the reality is going to hit everyone who believed the fantasy of permanent asset bubbles especially hard. Thank you, Eric T. ($200), for your beyond-outrageously generous contribution to this site-- I am greatly honored by your steadfast support and readership. These charts help us understand that a top is not just price, but a reversal in extremes of margin debt, valuation and sentiment. In blow-off tops, extremes of valuation, complacency and margin debt can always shoot beyond previous extremes to new extremes. This is why guessing when the blow-off top implodes is so hazardous: extreme can always get more extreme. At tops, soaring margin debt no longer pushes stocks higher. 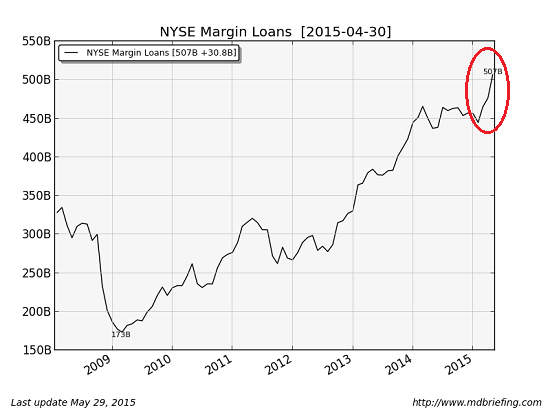 I've marked up an excellent chart by Doug Short to highlight the diminishing returns of more margin debt at tops. It's clear this same dynamic of diminishing returns is in play now, as margin debt has skyrocketed while the S&P 500 has remained range-bound, with each new high being increasingly marginal. It appears that the Shenzhen bubble has burst. 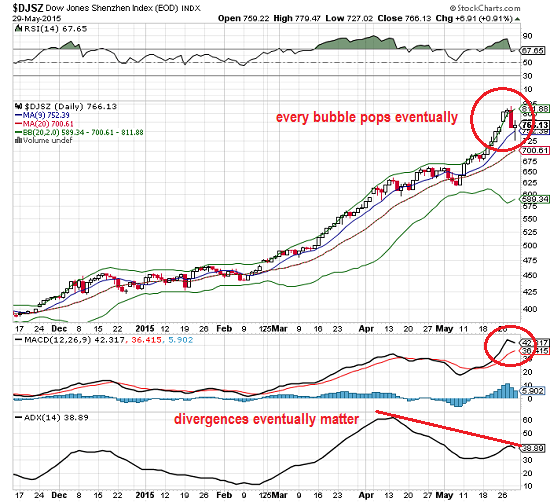 Latecomers to the bubble party will continue to buy the dips, but the ADX (a measure of trend strength) has been diverging for quite some time, and the MACD is rolling over into a sell signal. 1. Central banks did not want bubble markets in 2000 and 2008 to burst, either, but the bubbles popped despite central bank interventions. 2. Extremes can only get more extreme for a limited time. margin debt cannot rise from $507 billion to $5 trillion and then on to $50 trillion (three times the size of the U.S. GDP). The Shenzhen PE ratio cannot rise from 70 to 700. 3. Complex systems cannot be beaten into submission by two simple sticks (central bank liquidity and zero interest rates) forever. 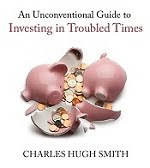 Extremes give rise to dislocations that cannot be beaten into submission by central banks for this reason: it is the nature of complex systems to break at the very points that cannot be strengthened or defended by simplistic manipulation. 4. When the speculative frenzy dissipates, central banks will be the only buyers left. Unless the Fed increases its balance sheet from $4.5 trillion to $14.5 trillion in a matter of months, even central bank manipulation will be swamped by sellers exiting bursting-bubble markets. Thank you, Mark H. ($50), for your stupendously generous contribution to this site-- I am greatly honored by your steadfast support and readership. How do you support a consumer economy with stagnant incomes for the bottom 90%, rising basic expenses and crashing employment for males ages 25-54? Answer: you don't. 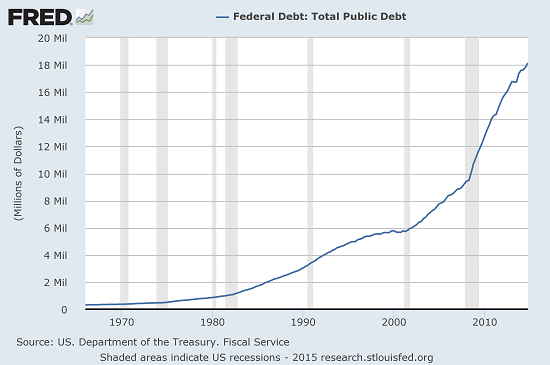 Here's the question this raises: is the sliver that's left enough to support a $17 trillion consumer economy? The answer is obvious: no. 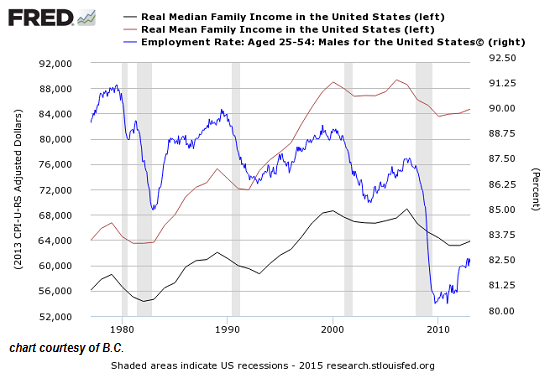 Stagnant household income has a number of systemic causes, including the generational decline of full-time employment (A Rising Share of Young Adults Live in Their Parents’ Home) and the concentration of wage gains in the top 10%. These dynamics are not easily addressed, for the simple yet profound reason that the amount of human labor that generates a meaningful profit in a stagnant, over-indebted, financialized economy is declining. 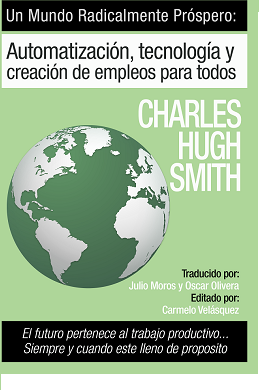 The only way most enterprises can sustainably earn a profit is to offload costly human labor (with its immense burdens of healthcare, pensions, workers compensation, disability insurance, etc., and the heavy regulatory burdens of workplace rules) and replace it with networked software and smart machines. The types of human labor that generate hefty profits are increasingly scarce, and as a result entry-level pay and employment are both capped by the high costs of human labor (even at minimum wage) and the relatively meager profits generated by conventional labor. Most of the big profits are generated not by labor but by financialization, stock buybacks and other financial gaming of debt and leverage. The few areas of human labor that generate hefty profits are either in the protected fiefdoms of state-enforced cartels, or in financial services (i.e. those playing the financial games with debt and leverage) or those creating the software and machinery that replaces costly human labor. Nearly half of disposable income is spent on housing and food. More than 50% of disposable household income is spent on housing and transportation (overwhelmingly autos). 25% of disposable income is spent on autos and health care. Two-thirds of gross income is spent on taxes, housing, transportation, and health care. Millennials, most especially males, coming of age since the mid- to late 2000s do not earn enough to afford the major components of household spending, i.e., taxes, housing, autos, and health care (insurance). The self-reinforcing feedback effect of lack of gainful employment and after-tax earned income causing insufficient purchasing power for housing, auto transport, and healthcare insurance that then results in lack of growth of demand for same will persist indefinitely hereafter, i.e., permanently, including reducing the rate of coupling, marriage, fertility, household formation, etc. 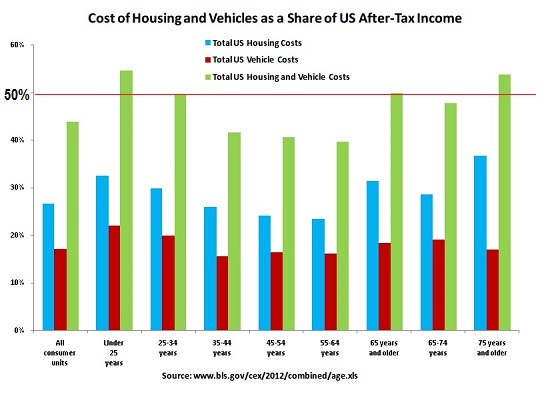 Here is a chart of housing and vehicle costs, broken down by age group. Note that only the peak-earnings middle groups spend less than 50% on housing and transportation. How do you support a consumer economy with stagnant incomes for the bottom 90%, rising basic expenses and crashing employment for males ages 25-54? Answer: you don't. 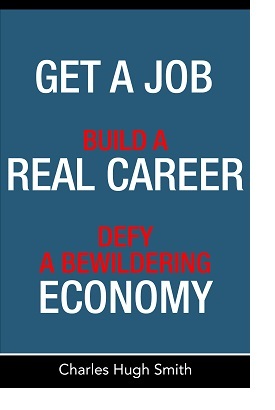 The media shills, government lackeys and PR-pimps can spin the GDP and other gamed statistics as much as they want, but no amount of statistical gaming will change the stagnation that results from generational declines in employment, flat wages and rising basic household expenses. Thank you, anonymous from Seattle ($200), for your beyond-outrageously generous contribution to this site-- I am greatly honored by your steadfast support and readership. 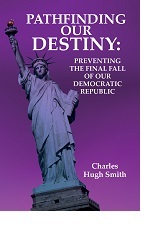 As it stands now, U.S. healthcare will bankrupt the nation and doom it to permanent stagnation and recession. That healthcare alone is dooming the U.S. economy is not news to Of Two Minds readers, as I have been covering the catastrophic consequences of our runaway healthcare system for the past decade. Three charts crystallize the healthcare dynamics that are dooming the U.S. economy. The first depicts the runaway growth of healthcare costs--a rapid expansion that is a permanent feature of U.S. healthcare, regardless of which party is in office or what reforms are instituted. This expansion of costs has many drivers, most of which result from the system's perverse incentives for fraud, overbilling, marginal treatments and defensive medicine.Technological and medical advances offer more options for treatment, and can push costs up--but advances can just as readily push costs down, too. 6. America's inability and/or unwillingness to have an adult discussion over end-of-life care for the elderly. 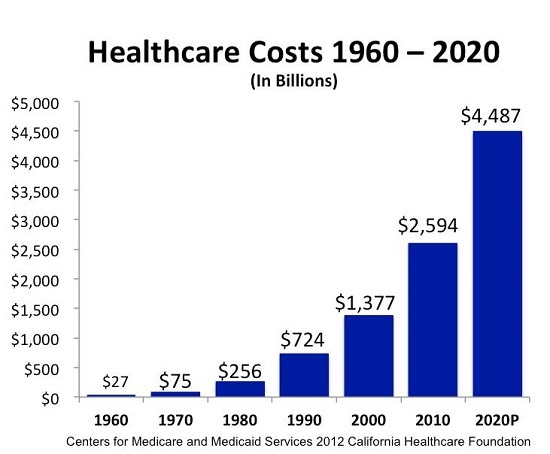 Here is a chart of the rising cost of U.S. healthcare, which is far outstripping the growth of GDP, which is another way of saying healthcare costs are outstripping our ability to pay for healthcare. Other advanced nations pay for universal healthcare with 8%-9% of their GDP, where the U.S. spends 18% of GDP on less-than-universal healthcare. How do other advanced countries provide healthcare for all for less than half of what America spends per person (per capita)? Other advanced nations do not spend gargantuan sums on the elderly and end-of-life care. Please look carefully at this chart. 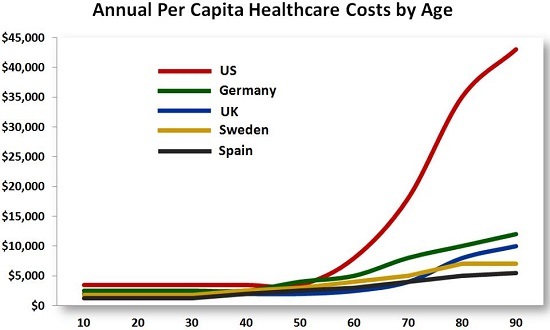 No one with any knowledge of life in Sweden or Germany would declare their care of the elderly barbarous, yet somehow Sweden's cost of care actually declines as the elderly approach the end of their lives, while the cost of care for the elderly skyrockets in the U.S.
Is medical care that different technologically in the U.S. and Sweden, or is it the difference between a system that is rational and one that is based on extracting the maximum profit from delivering whatever the government will pay for? Tt is clear that per-person spending among the highest users is substantial and represents a natural starting point when thinking about how to curb health care spending. 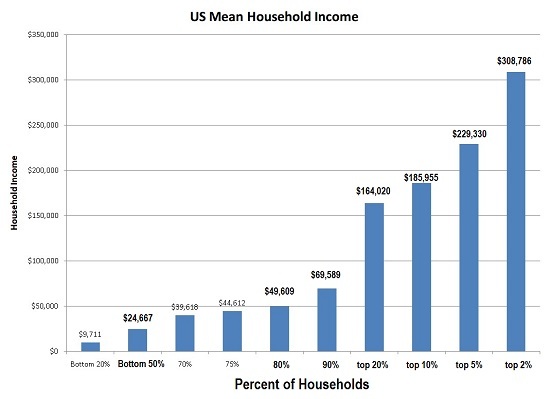 For instance, the average expenditure for each of the approximately 3 million people comprising the top 1 percent of spenders was more than $90,000 in 2009 (Figure 2). The top 5 percent of spenders were responsible for $623 billion in expenditures or nearly $41,000 per patient. In contrast, mean annual spending for the bottom half of distribution was just $236 per person, totaling only $36 billion for the entire group of more than 150 million people. The concentration of healthcare expenditures in a thin slice of the populace is astonishing: 20% of the costs are spent on 1% of the populace, typically elderly people with multiple chronic lifestyle-related diseases. 50% of the total costs are spent on the top 5% of high-use individuals. 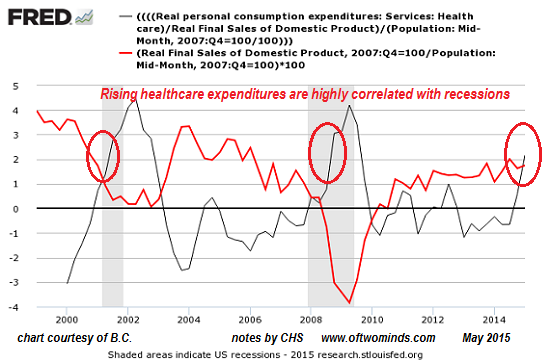 One direct result of rising healthcare expenditures is recession, as this chart from frequent contributor B.C. illustrates. As healthcare expenditures rise, real sales stagnate and the economy cascades into recession. The majority of U.S. healthcare spending is not productive; it is a drag on productivity. Subtract the fraud, overbilling, defensive medicine, marginal/ineffective overtreatments and tests and the extreme concentration of costs in 5% of the populace, and we'd have a system that we could afford, i.e. one that cost less than 10% of GDP, in line with our advanced-economy competitors. As it stands now, U.S. healthcare will bankrupt the nation and doom it to permanent stagnation and recession. It's our choice: live with a bankrupt system built almost entirely of perverse incentives, or begin an adult discussion about a system that delivers responsible care to the elderly in line with other advanced nations, but at a fraction of the current cost. Thank you, Jose S. ($100), for your outrageously generous contribution to this site-- I am greatly honored by your steadfast support and readership. Of Two Minds could easily be worth $50 million in a matter of months. 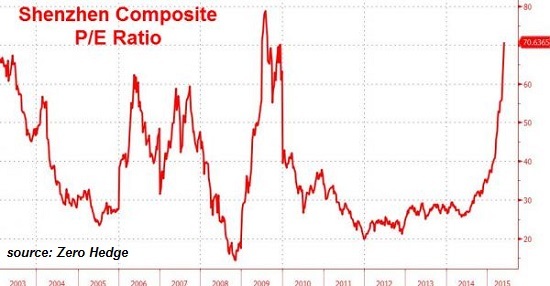 This second chart displays the Shenzhen's price-earnings ratio (PE), a widely used measure of fundamental valuation. If a company's stock is worth $100 per share, and its net earnings are $10, it has a PE of 10. If a company's stock is worth $100 per share, and its net earnings are $1, it has a PE of 100. Financial firms accepted the risk that they would be unable to anticipate the onset of a crisis in time to retrench. However, they thought the risk was limited, believing that even if a crisis developed, the seemingly insatiable demand for exotic financial products would dissipate only slowly, allowing them to sell almost all their portfolios without loss. The take-away from this is to join the party and offload marginal enterprises at sky-high valuations to greater fools--which is why I plan on listing Of Two Minds as an IPO on the Shenzhen Exchange. Based on the insane PE ratio of Shenzhen listed companies, Of Two Minds is worth at least $5 million. But there are various premiums that have to be included in this base valuation. 1. Of Two Minds is highly flexible. It might IPO as Of Two Minds Mobile Apps, unless mobile apps are no longer fashionable, in which case we'll change the name to Of Two Minds P-to-P (peer-to-peer). This adds at least $1 million to the base valuation. 2. 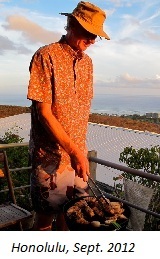 Of Two Minds is based in the San Francisco Bay Area (with an active branch in Hawaii). Just being in the white-hot tech frenzy of the Bay Area adds at least $1 million to the base valuation. 3. The growth possibilities are staggering. The Internet is global, and the global population who reads English or has access to online translation is equally vast. This adds at least $1 million to the base valuation. 4. Of Two Minds is in the hot alternative-media space, which includes mobile apps, peer-to-peer marketing, social media--basically every hot technology relates back to alternative media. This adds at least $1 million to the base valuation. So here's the deal: an enterprising entrepreneur, hedge fund or private equity fund can snap up Of Two Minds for a pre-IPO price of only $10 million. 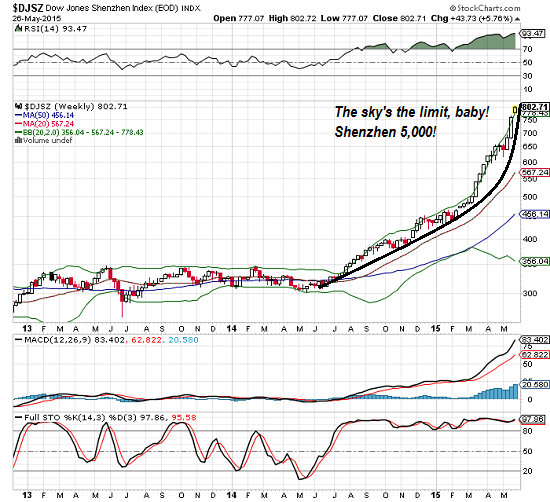 Who knows how high the Shenzhen Composite can go? 1,000? 3,000? Heck, why not 5,000? Of Two Minds could easily be worth $50 million in a matter of months. $10 million is insanely cheap for a company that's about to IPO on the Shenzhen. The sky's the limit, Baby! Thank you, Helen S.C. ($10), for yet another wondrously generous contribution to this site-- I am greatly honored by your steadfast support and readership. The nation is wallowing self-piteously in a fetid trough of denial and adolescent rage/magical thinking now that the nation's bogus, debt-based "prosperity" has crashed and cannot be restored. If you type Deep State into the custom search window in the right sidebar, the search results fill 10 pages. I think it is fair to say I have long had a deep interest in the Deep State. The Deep State is generally assumed to be monolithic: of one mind, so to speak, unified in worldview, strategy and goals. In my view, this is an over-simplification of a constantly shifting battleground of paradigms and power between a number of factions and alliances within the Deep State.Disagreements are not publicized, of course, but they become apparent years or decades after the conflict was resolved, usually by one faction consolidating the Deep State's group-think around their worldview and strategy. Have We Reached Peak Wall Street? Consider what the extremes of Wall Street/Federal Reserve predation, parasitism, avarice and power have done to the nation, and then ask if other factions within the Deep State are blind to the destructive consequences. 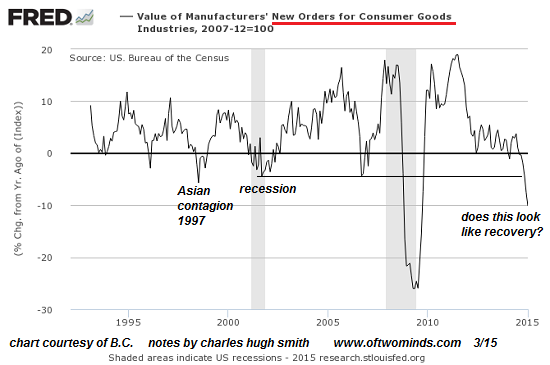 Why does financial sector growth crowd out real economic growth? (Bank for International Settlements) After studying how financial development affects aggregate productivity growth, we concluded that the level of financial development is good only up to a point, after which it becomes a drag on growth, and that a fast-growing financial sector is detrimental to aggregate productivity growth. Here is a sketch of The Deep State Network, which includes not only the nodes of centralized power but of the institutions that feed and support the Deep State's decisions and policies. These include Ivy League and federally funded research universities, the Mainstream Media, think-tanks, NGOs (non-governmental organizations) and the spectrum of institutions that influence the public's ability to frame and contextualize events, i.e. the institutions of propaganda. 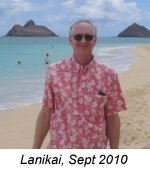 A recent interview with Deep State scholar Peter Dale Scott made me wonder if the increasingly repressive policies of the visible state are also being recognized as destabilizing and therefore a threat to the entire American Imperial Project. Scott's key phrase is surplus repression, which I interpret to mean repression that exceeds the practical needs of the Deep State to maintain public order. We can anticipate the Deep State fracturing over the question of how much repression is enough: those who believe there is no upper limit on the effectiveness of repression, and those who understand that at some point, unlimited policing and financial repression will unleash a social destabilization that will threaten the integrity of the Empire and the Deep State itself. Peter Phillips: We’re really happy to have you here. I’ve just finished reading your book, The American Deep State: Wall Street, Big Oil, and the Attack on U.S. DemocracyIn your new book you talk about the egalitarian mindset culture of America. We believe in the Constitution, the Bill of Rights, open government, transparency. And then you say also that there’s a dark side, or a deep side inside America that’s repressive, that is looking to be able to detain people without warrants, warrantless wire tapping and all of that – there’s a repressive side. Can you tell us a little bit more about how you frame this understanding of this culture of repression? But it’s not in its essence repressive; it’s just repressive when it wants to be. 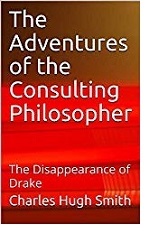 I think a lot of the trouble we’re in now, actually is – and I say this in my book – that in the 1970s the deep state – the bankers, the lawyers, the people in foundations, all kinds of people – were really quite terrified at the forces in America calling for revolution – the African-Americans, but also, equally and perhaps ultimately even more, the anti-war movement because if you had a successful anti-war movement that would mean America would have to get out of the business of war. And that was, I think, an intolerable thought for them. I think the Deep State was terrified of more than the anti-war movement--it was terrified of the counter-culture, which threatened the entire status quo of mindless consumerism and obedience to authority. The Counterculture, which included the culmination of the Civil Rights Movement and the birth/expansion of the feminist movement, Eastern spirituality in the U.S., back-to-the-land self-sufficiency, rock music as a cultural force, the nonviolent anti-war movement, the anti-nuclear movement, experimentation with communal living and drugs, Futurist concepts, and a widespread expansion of freedom of self-expression and experimentation. Many observers believe this era also launched a Fourth Awakening as evangelical denominations expanded and "Jesus freaks" found religious inspiration outside mainline churches. Which changed the world, of course. Those darn hippies! 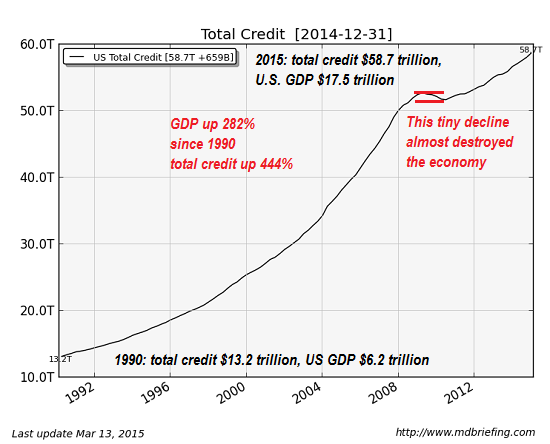 The nation is wallowing self-piteously in a fetid trough of denial and adolescent rage/magical thinking now that the nation's bogus, debt-based "prosperity" has crashed and cannot be restored, though the visible state (Federal Reserve and elected officials) keep trying to glue Humpty Dumpty back back together again. The Deep State has been busy powering up the immense machinery of full spectrum repression to contain the inevitable disarray that will follow the collapse of the nation's bogus, debt-based "prosperity." Our best hope for a productive outcome is that the cadre of those inside the Deep State Network who grasp the self-defeating nature of repression will gain influence over their repression-obsessed peers. Thank you, Cudick A. ($100), for yet another outrageously generous contribution to this site-- I am greatly honored by your steadfast support and readership. Ridding the world of Monsanto via a state buy-out would be a boon to humanity. Capitalism fails in two situations: monopoly and state-capital cronyism. Monopoly extinguishes competition and that effectively extinguishes capitalism. When the elites of the state and private capital collude, i.e. crony capitalism, the few gain power and wealth at the expense of the many. The state (broadly speaking, government) fails when it serves the few at the expense of the many, while claiming to serve the interests of the many. 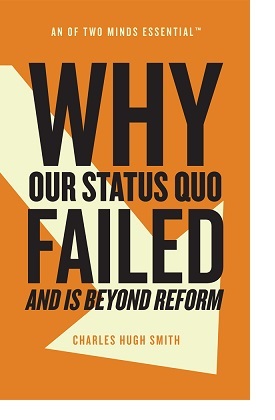 The state only fulfills its purpose when it serves the interests of the many at the expense of the few who control the majority of the political power and private wealth. Monsanto is the epitome of monopoly and crony-state collusion. But Monsanto's grip is not only on the throat of the nation-- through its monopoly on seeds that it enforces globally, its grip is strangling the entire world. Monopolies on food, energy and water (what I term the FEW resources) are not like monopolies on discretionary goods and services. People have to pay whatever the monopoly charges, as substitutes are either unavailable, very expensive or under the control of the same cartel/quasi-monopoly. 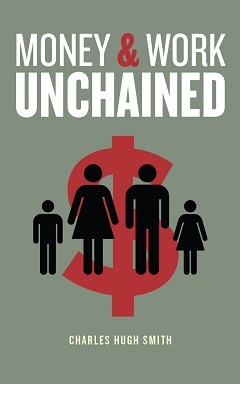 Before Monsanto extended its grip as the state-enforced seed monopoly, state universities and extension services developed seed strains and provided the seeds for a nominal cost.Over time, this publicly owned and managed system of providing low-cost seeds has eroded under pressure from for-profit private firms such as Monsanto and the benign neglect of a government that has been captured by private interests and self-serving elites. The supposed benefits of costly monopoly-developed GMO seeds is increasingly being questioned: Plant Breeding vs. GMOs: Conventional Methods Lead the Way in Responding to Climate Change. The rapid advance of gene sequencing is opening new doors for much quicker development of conventional plant breeding techniques that require no genetic modification (GMO). If the American people wanted to bestow a gift to the world that would be valued by billions of people yet would cost the American citizenry a ridiculously modest sum, it would be to nationalize Monsanto and provide its seed products for free. To do this requires letting go of all the self-serving neoliberal fantasies that crony-capitalists propagandize to protect their monopolies: for example, only the profit motive drives innovation, so only private companies can supply the world with advanced seeds. All this propaganda boils down to defending monopoly and cronyism as capitalism--The Big Lie of all monopolists and crony-capitalists. This was the reason given for privatizing publicly owned utilities that are then transformed into highly profitable monopolies--the precise opposite of capitalism's primary engine of innovation. Monsanto is worth around $57 billion. Compare this to the Federal debt of $18 trillion, or the full lifecycle cost of the bloated F-35 fighter aircraft program, which weighs in at $1 trillion. We should also compare $60 billion with the $16.8 trillion that the Federal Reserve loaned the world's too big to jail banks. Ridding the world of Monsanto via a state buy-out would be a boon to humanity, and doing so for a mere $57 billion would be a bargain--especially when you consider the $3 trillion the state has squandered on endless wars of choice and the trillions of dollars the Federal Reserve and the government have squandered propping up the self-serving, parasitic cartel of too big to jail banks. Thank you, Jon J. ($50), for your magnificently generous contribution to this site-- I am greatly honored by your support and readership.